We have already seen what Underground cables are, and where they’re used. Moving forward, we must understand various types of Underground cables available to us. Typically, an Underground cable has either one, three or four cores. These cables are of course, constructed accordingly. High tension cables: These have a maximum voltage handling capacity of 11 kV. Super tension cables: These have a maximum voltage handling capacity of 33 kV. Extra high tension cables: These have a maximum voltage handling capacity of 66 kV. Extra super voltage cables: These are used for applications with voltage requirement above 132 kV. In such cables, the conductors (usually three) are bunched together and then bounded with an insulating paper ‘belt’. 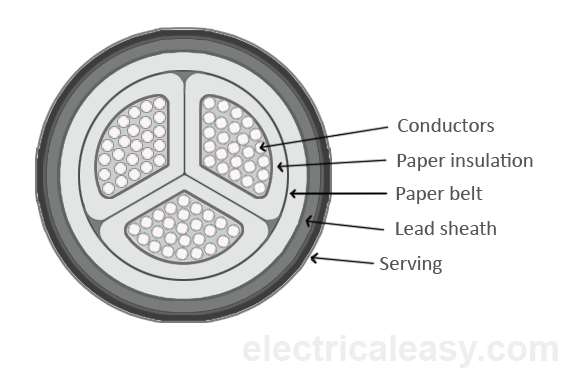 In such cables, each conductor is insulated using paper impregnated with a suitable dielectric. The gaps between the conductors and the insulating paper belt are filled with a fibrous dielectric material such as Jute or Hessian. This provides flexibility as well as a circular shape. As we discussed earlier (in Construction of Cables), the jute layer is then covered by a metallic sheath and armouring for protection. One particular speciality of this cable is that its shape may not be perfectly circular. It is kept non-circular to use the available space more effectively. There are some limitations of such construction. Since the electric field is tangential, the insulation provided is stressed. As a result, the dielectric strength falls over time. Hence, such construction isn’t preferred for voltage levels above 11 kV. Further divided as H-type and S.L. - type cables. H-Type Cables: It was first designed by M. Hochstadter. The three cores are individually insulated with paper and then covered by a metallic screen / cover. These metallic covers are perforated. As a result, such construction allows the three metallic screens to touch each other. These three metallic covers are then grouped together in a metallic tape usually made of copper. A lead sheath surrounds this construction. The metallic covers and the sheath are grounded. The obvious advantage is the electric stresses are radial, not tangential and hence of lesser magnitudes. Also, the metallic covers improve the heat dissipation. 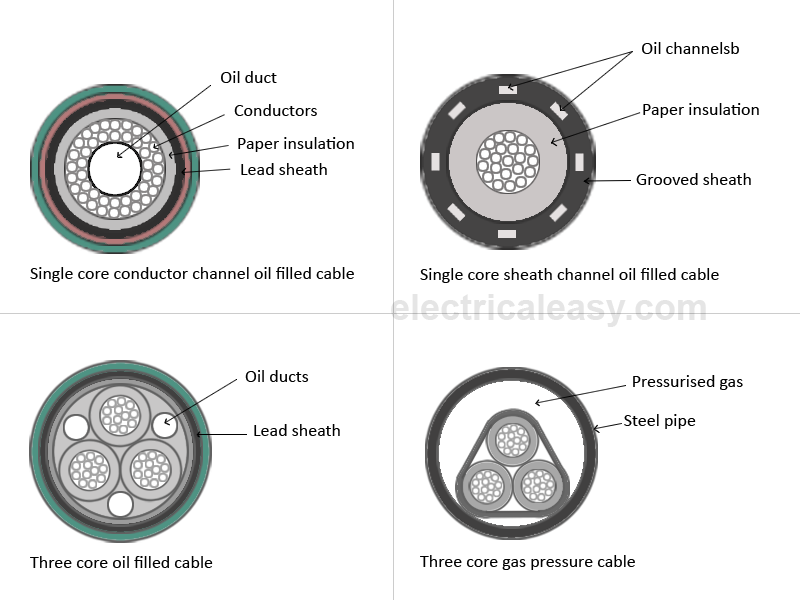 S.L Type Cables: It is similar to the H type cables, with the difference that each of the three cores has its own lead sheath. With this provision, the need for the overall sheath used previously is eliminated. The advantage of such a construction is that the chances of a core-to-core breakdown are greatly minimized. Also, the flexibility of the cable is improved. The limitations are severe. Such construction is limited for voltages up to 66kV only. The individual sheaths are thinner, and if there are constructional defects, moisture may enter the cable and reduce its dielectric strength. H.S.L. Type Cables: This type of cable is combination of H type and S.L. type cable. In these cables each core is insulated with impregnated paper and provided with seperate lead sheaths. For voltages beyond 66 kV, the electrostatic stresses in the cables exceed the acceptable values and solid cables become unreliable. This occurs mainly because voids are created when voltages exceed 66 kV. Hence, instead of solid cables, we use Pressure cables. Typically, such cables are either oil filled or gas filled. Oil Filled Cables: Oil is circulated under suitable pressure through ducts provided for such purpose. This oil supply and pressure are maintained through reservoirs kept at proper distances. The oil used is the same that is employed for impregnation of paper insulators. Gas Filled Cables: Pressurized gas (usually dry nitrogen) is circulated around cables in an air-tight steel pipe. Such cables are cable of carrying higher values of load current and can operate at higher values of voltage. But the overall cost is more. Various insulating materials used in cable construction are Rubber, Paper, PVC, XLPE (Cross linked Polyethene) etc. Such classification is based upon operating temperature limitations. Following are some insulating materials used and their maximum operating temperatures. Direct Buried: As the name suggests, the conductors are buried underground in a trench without additional accessories. Sometimes cooling pipes are added if required. Once the cables are installed, there’s no visible sign above the ground. Trough: Concrete troughs are dug and cables are installed in them. They’re visible on the surface. Maintenance is easier. Tunnels: Sometimes, tunnels are dug up for this purpose. Such construction is mainly employed if a river needs to be crossed or if the intended power distribution is to a major city. Maintenance and future expansion is easier, but initial cost is higher. Gas Insulated Lines: This is a relatively new technology. For cables operating at higher voltages and currents, and handling high power, such gas insulated line construction is safer. It is being employed nowadays for advanced projects.